Commercial real estate transactions almost never use a one-size-fits-all approach, a statement that is especially true when leasing is involved. Commercial property owners have several different lease options to choose from, each of which offers its own benefits and pitfalls. However, some are more landlord friendly, while others are more tenant friendly. If you are in the business of renting out commercial space, it is important that you understand the different types of leases available so that you can make an informed decision when choosing the best one for you. The gross lease is the most tenant friendly option as it makes things a lot less complicated for the tenant. When a tenant and landlord sign a gross lease, the tenant pays one lump sum to the landlord, who then deducts payments for expenses like property taxes, insurance, utilities, and other payments associated with the property. If you opt to use a gross lease, it is important that you include exceptions for occupants that use excessive power or create another type of financial burden, as if you do not, you could end up paying a majority of your rent toward a monthly bill. There are several different types of net leases, the most common of which are a single net lease (N lease), a double net lease (NN lease), and a triple net lease (NNN). Each type of net lease requires that the tenant pay a base rent for the space, and then additional costs, which the landlord can decide on. Some additional costs include insurance, property taxes, the cost of maintenance, property management fees, the cost of lobby personnel, janitorial services, trash, water, sewage, parking lots, or any other shared service. What fees that landlord has the tenant pay depends on how many other tenants share the same building. This type of net lease is most similar to a gross lease, except the tenant will be asked to pay a portion of the property taxes and possibly for a portion of janitorial services and whatever utilities he or she uses. With this type of lease, the tenant will again pay a portion of property taxes, janitorial services, and utilities, but he or she will also be required to pay a portion of the insurance. The landlord continues to be responsible for other expenses, including property maintenance and repairs. The triple net lease is the most favorable for landlords as it requires the tenant to pay for all or most of the expenses in addition to a monthly rent. With this type of lease, the tenant is even responsible for paying for janitorial services, property maintenance, and other costs of occupancy. This type of lease is helpful for the landlord as it guarantees a set income every month and it negates the possibility for having to pay higher in utilities one month versus the other, or for having to account for an increase in service prices. When operating under an NNN lease, you should expect for your tenant to want to negotiate for caps on how much you can raise rent annually and other stipulations to make it a bit easier for them to forecast their expenses. 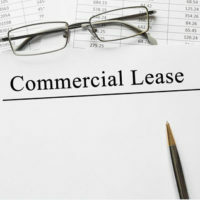 There are a couple of other types of leases, including the absolute triple net lease, which is more stringent than the NNN lease, or the modified gross lease, which offers a compromise for both parties. These types of leases are more custom than the four other types and as such, require a carefully worded and negotiated contract. Bear in mind too that, as a landlord, you will be charged sales tax on your rental property, in accordance with F.S. §212.031. This is another type of fee that you should consider including in your overall rent charges or in your lease agreement. If you are in the business of renting out your commercial property, you should think carefully about the type of lease you choose to use and why you want to use it. Some options may be more suited to your needs than others, and some require more stringent contracts than others. To be sure that you are using the best contract for your business, and to ensure that the contract is fair, sound, and most of all enforceable, work with a knowledgeable Fort Lauderdale real estate lawyer. The right lawyer can help you draft a lease that is beneficial to both you and the tenant and that leaves absolutely zero room for interpretation. Schedule your initial consultation with an experienced attorney today, and call the law offices of Edward J. Jennings, P.A., now.